The shoe concept "EIN/TRITT"combines traditional shoe production with modern manufacturing which results in a considerable simplification of the production flow. Flat shoe patterns with reinforced parts get folded and fixed. The client experiences the transformation of the shoe from its initial flat state into a comfortable wearable object. 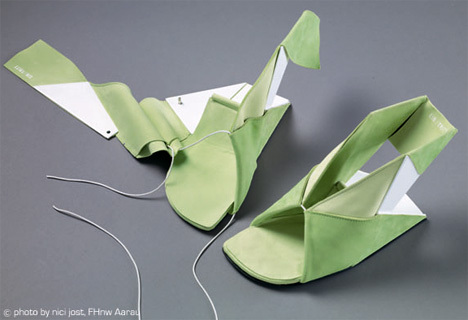 From the formal aesthetic point of view the folding gives the shoe a more architectural character. Designed by Catherine Meuter - she is an industrial designer based in Switzerland and designs many other innovative concepts, I encourage you to click on over.